Sediment provenance analysis has become increasingly popular in the last decade due to the many applications it has for hydrocarbon exploration and production. Examples of these applications include tying reservoir sediment sources to specific terranes in order to better understand how sediment source-to-sink relationships have evolved over the period of reservoir deposition; improved understanding of sediment pathways, reservoir geometries and sandon-sand contacts; and as a constraint on gross depositional environment maps. It also provides insights into reservoir quality, which is partially a product of sediment provenance. High amounts of K-feldspar, the dissolution of which can dramatically enhance sediment porosity, or of olivine, pyroxene and amphibole, which can provide the elements necessary for pore-choking chlorite formation, are related to the erosion of specific sediment source lithologies. Chemostrat has successfully applied detrital zircon U-Pb geochronology and/or Raman heavy mineral analysis (a technique named after the Indian physicist and 1930 Nobel Prize for Physics winner, Sir Chandrasekhara Venkata Raman, who carried out ground-breaking work in the field of light scattering) on cuttings and core samples from sedimentary successions in a number of different geological settings and geographical areas. In each case the technique revealed new insights into the sediment provenance. A provenance switch is clearly documented in the Southern North Sea Basin, where zircon geochronology, in conjunction with a review of published source terrane ages, indicates that Carboniferous sandstones are derived from multiple basement terranes. A northerly Scandinavian hinterland is recognised as the sediment source for the Caister and Lower Ketch Formations, with (see Figure 1) sediments containing zircon grains from the Idefjorden Terrane in south-eastern Norway and south-western Sweden (c. 1,650–1,600 Ma), Mesoproterozoic to Neoproterozoic terranes in southern Norway (c. 970–920 Ma) and the Caledonian Belt (c. 450–400 Ma). Figure 1: U-Pb ages of zircon grains of Carboniferous sandstones of the Southern North Sea Basin. A) probability density plot for all analysed grains, with source terrane ages. B) heat-maps of each analysed formation. Source: Chemostrat. Derivation from the Bohemian Massif of northern Germany, which is a source of late Neoproterozoic zircon grains related to the Cadomian Orogeny (c. 650–550 Ma), and from the Variscan Front (c. 380–280 Ma) is evident for the Upper Ketch, De Lutte and Boulton Formations. Zircon age populations equivalent to those of the Cadomian and Variscan Orogenies are not identified in Scandinavia, clearly suggesting these formations have a different, southerly provenance compared with that of the Lower Ketch and Caister Formations. Additionally, a provenance change between the Lower Ketch sandstones and the Upper Ketch sandstones can be suggested due to the different zircon age populations recognised (Figure 1B). The Lower Ketch sandstones have a similar provenance to that of the Caister Formation, whereas the Upper Ketch sandstones have an equivalent provenance to the Cleaver Formation. The Westoe Formation has a unique provenance signal. In the North Sea example, clear evidence of provenance was detected using a single provenance technique (zircon geochronology); however, in most instances successful provenance studies require a multi-disciplinary approach. In the Grand Banks, offshore eastern Canada, Chemostrat has compiled a large, unprecedented dataset of both heavy mineral analysis, performed via Raman spectroscopy, and detrital zircon U-Pb geochronology. From this we have been able to demonstrate the value of the integration of the two techniques to determine the sediment provenance for the Jurassic to Cretaceous succession in the Grand Banks. Figure 2: Heat-map of detrital zircon U-Pb ages and pie-charts of heavy mineral assemblages in six sandstones intersected by a western Jeanne d’Arc Basin well. Source: Chemostrat. For example, in the western Jeanne d’Arc Basin, a shift in detrital zircon ages from predominantly Neoproterozoic (in Jurassic to Lower Cretaceous sandstones) to predominantly Devonian-Silurian (in younger sandstones) is observed (heat-map in Figure 2). Neoproterozoic zircon ages can be associated either with provenance from the sedimentary succession of the Avalon Zone of eastern Newfoundland, or with provenance from felsic igneous rocks. The first hypothesis is supported by the heavy mineral assemblages of Jurassic to Lower Cretaceous sandstones, which are enriched in ultrastable minerals that can survive sediment recycling, such as zircon, tourmaline and rutile (pie-charts in Figure 2). Additionally, an input of ‘first-cycle’ sediment derived from metamorphic units occurred in the shallowest analysed Jurassic sandstones, which contain metamorphic minerals (pie-charts in Figure 2). The Devonian-Silurian felsic igneous rocks that provided zircon grains cannot be the only source of sediment during the Late Cretaceous. Additional sources must have been present, which provided the observed c. 10% Cr-spinel and c.20% high-grade metamorphic minerals, probably derived from the metamorphic basement and the associated ophiolites of western Newfoundland. Derivation from these terranes would have been missed if only detrital zircon geochronology was applied. A multi-disciplinary sediment provenance study has also been performed for the sedimentary succession of onshore Tanzania, showing an important provenance change occurring at the Mesozoic/Cenozoic boundary. Raman heavy minerals analysis demonstrates a predominance of garnet and apatite versus kyanite and epidote in Cretaceous sandstones, but not in Paleogene sandstones (Figure 3A). Figure 3: Results of Raman heavy mineral analysis (A) and detrital zircon U-Pb geochronology (B) performed on sandstones from onshore Tanzania. Data from McCabe (in prep.) *Garnet Types after Mange and Morton (2007). Source: Chemostrat. 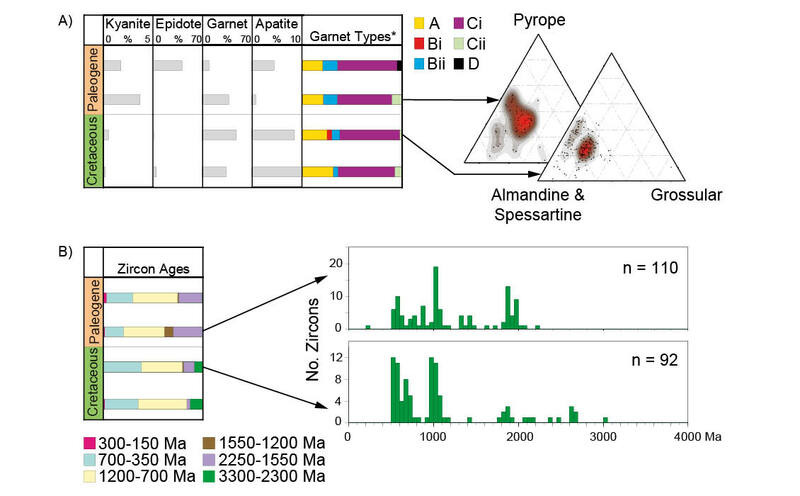 Raman spectroscopy allows the determination of different proportions of garnet end-members; results can be processed following Mange and Morton (2007) to relate different garnet ‘types’ with the lithologies the garnet grains are derived from. Provenance from highgrade granulite-facies metasedimentary rocks (‘type A’ garnet grains) are seen to be more prevalent in Cretaceous than in Paleogene sandstones, whereas provenance from low-grade metabasic rocks (‘type D’ garnets) is only documented for the youngest analysed sandstones. These sandstones also contain around 40% epidote in their heavy mineral assemblages, a mineral typically derived from greenschist-facies metamorphic rocks, and which has also been found in high concentrations in Eocene to Oligocene sandstones onshore Tanzania (Nerbraten, 2014). At the Mesozoic/Cenozoic boundary the detrital zircon age populations also change (Figure 3B), supporting the results of heavy mineral analysis. These case studies demonstrate that Raman heavy mineral analysis and detrital zircon U-Pb geochronology, when combined, provide hydrocarbon explorers with exciting new insights into the sediment provenance story for their region. Understanding the impact of sediment provenance on the quality of any reservoir can clearly be enhanced through application of this technique. McCabe, R., In Prep. Geochemistry and mineralogy of the Mesozoic and Cenozoic sedimentary record in the Mandawa Basin, Tanzania. Unpublished Ph.D. Thesis. Trinity College, Dublin. Mange, M.A. and Morton, A.C., 2007. Geochemistry of heavy minerals. In: Mange, M.A. and Wright, D.T. (eds. ), Heavy Minerals in Use. Developments in Sedimentology Series, 58, 345 - 391. Nerbraten, K., 2014. Petrology and Sedimentary Provenance of Mesozoic and Cenozoic sequences in the Mandawa Basin. Master Thesis, Department of Geosciences, University of Oslo, 114pp. Over the last years offshore exploration activity has been at a historic high, without any significant corresponding discoveries. The result is a considerable increase in the global average discovery cost.